The Atlanta Journal-Constitution reported Sunday that Georgia is expected to announce a plan this summer that would dramatically expand the use of for-profit insurance companies in a new approach to managing Medicaid in Georgia. Roughly two out of ten citizens in Georgia receive Medicaid. The aged, blind and disabled make -up twenty-five percent of the two million Georgia residents receiving Medicaid. However, this group accounts for over half of all Medicaid spending. The bulk of costs for the elderly and disabled tend to come from long-term care. State legislatures report that Medicaid costs are expanding and putting increasing pressure on state budgets. Legislatures attribute the cause to rising health care costs and an increase in enrollment numbers due to the stagnant economy. Medicaid enrollment in Georgia grew 9.5% from 2009 to 2010. Medicaid enrollment grew in every state during the same period. At the same time, the economic downturn means that state budgets are experiencing shortfalls, making it harder to meet Medicaid needs. In other words, as tax revenues dip, Medicaid enrollment swells. 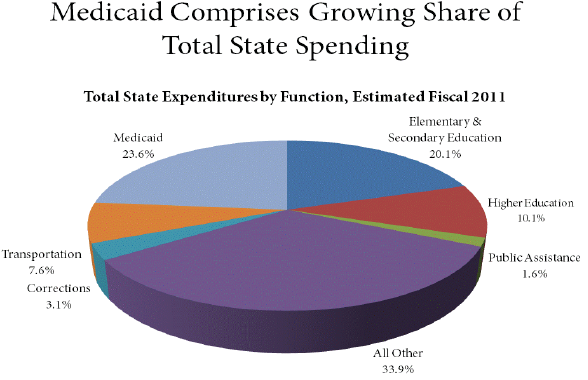 Conversely, when state revenue grows due to a strong economy, Medicaid needs diminish. Persons with disabilities who are receiving Medicaid are doing so through a program called Supplemental Security Income (SSI). The SSI program covers disabled workers whose income and assets meet stringent resource tests. Unlike Social Security Disability Insurance, SSI is not dependent on years of paying into the disability insurance program through FICA taxes to qualify. SSI is a need-based program. In an effort to restrain rising costs, many states are considering allowing for-profit managed companies to run the Medicaid program. Federal law prohibits states from lowering Medicaid eligibility. However, states can apply for waivers to test new or existing ways to deliver or pay for health care services in Medicaid and the Children’s Health Insurance Program (CHIP) programs. Under Section 1115, states can apply for program flexibility to test new or existing approaches to financing and delivering Medicaid and CHIP services. Under section 1915(b), states can apply for waivers to provide services through managed care systems. Many health care advocates and medical providers question whether for-profit companies in a Medicaid model can improve care, spend less and earn a profit, particularly when provider payments are at the lowest level already. States that have implemented cost-cutting measures and/or hired for-profit managed care companies to run Medicaid programs instituted reforms such as charging higher co-pays to dissuade recipients from “unnecessary” treatments. A significant body of research shows that while cost-sharing ideas (co-pays) may reduce Medicaid costs, they also create barriers to treatment for low-income populations. Shifting costs onto the population Medicaid was meant to serve – those who can least afford it – should not be an option. Those with permanent disabilities are often the most affected by Medicaid cuts. A chronic, medically disabling condition means one cannot return the workforce no matter what the state of the national economy. If you are considering applying for SSI benefits or have applied and been denied, contact Lisa Siegel for a free consultation.